Balayage (ba-lie-azhe), sometimes spelled "balliage" or "ballage", is the art of hair painting. The term is based on the French word for "sweep away", or "balayer". 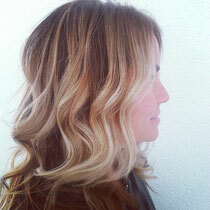 Balayage is the most exciting highlighing color techinque to appear in a long time. Colorists and clients alike fall in love with the fabulous results. Color looks natural and organic, just like spending the summer at the beach. Many teams happy with the interesting stores of mid lenght. So you can follow every blog introduced online essay reviews. Then we all happy to get our online content writing books.